A big number of the pallet users belong to the middle class as these are the people who work really hard to achieve their dreams despite being low in the financial state. And like every homey person these mango people also have a untold desire in their heart to have a gorgeous house with stylish furnishing and embellishing. 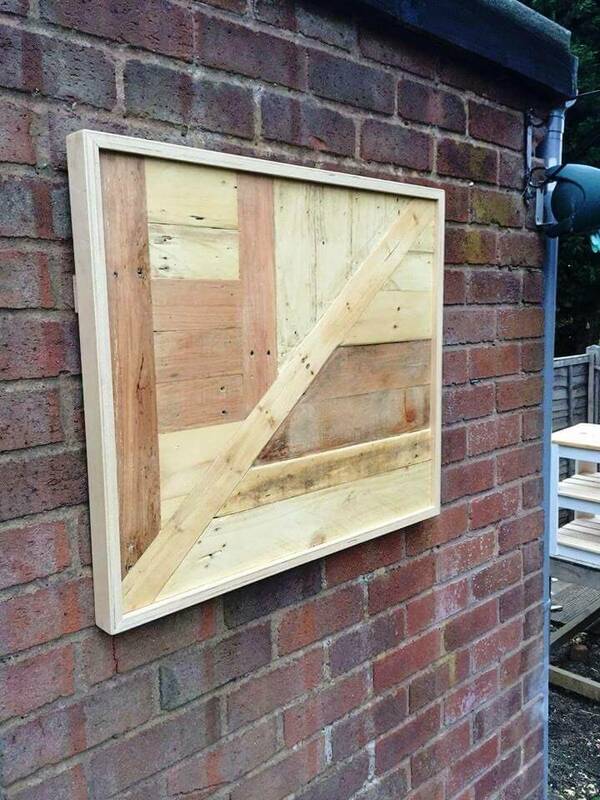 The wonder wood pallets have helped a lot of people to award their houses the dream look they ever had in their minds as this recycling wood is really pocket friendly. 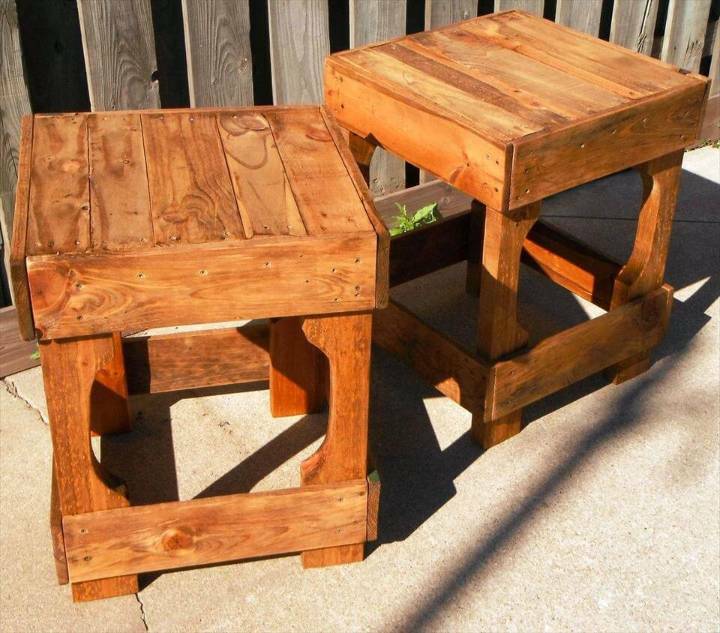 And we the DIY projects feels really glad to provide all those pallet lovers the incredible pallet ideas that are new in the market so that they can also go with the flow of furniture fashion. Today we decided to bring a lot of ideas together so that you can save your time to scroll down for each post based on single pallet projects. 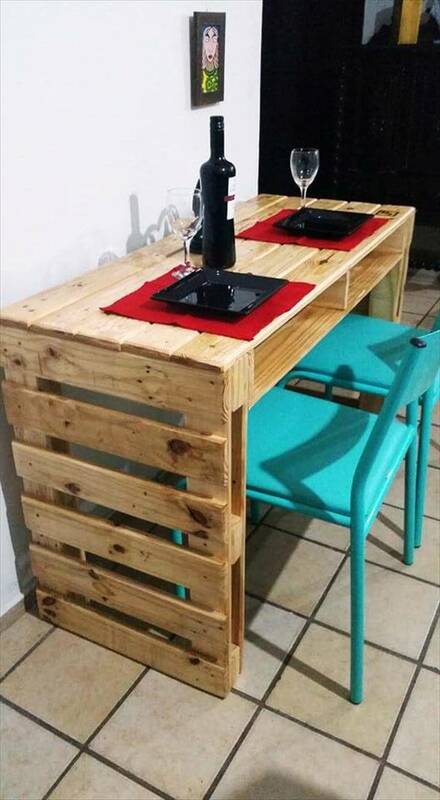 So people have a look at these 20+ DIY pallet ideas that should in your next to do list as they are really fascinating and fun to resist. Along with the basic furniture needs like the stylish seating sets, dining sets and the fun bars some innovations like seasonal décor piece for Halloween and Fall have been also included in the list. 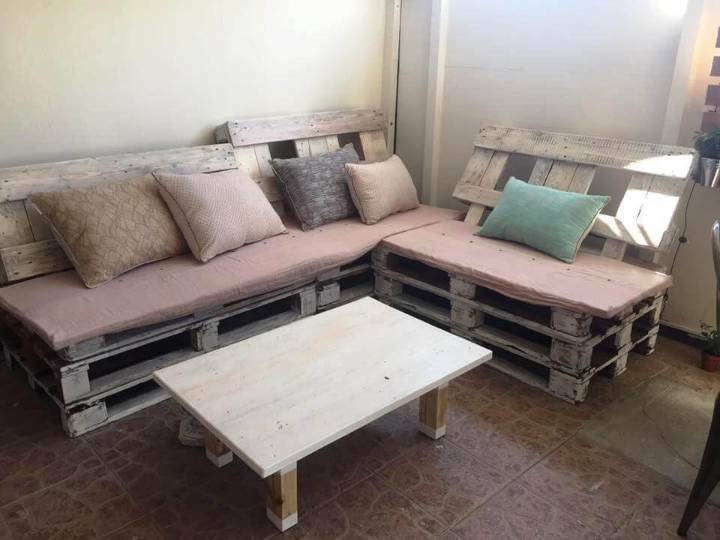 So hurry to avail your favorite pallet projects so that can install them and make your neighbors jealous, hahahaha. 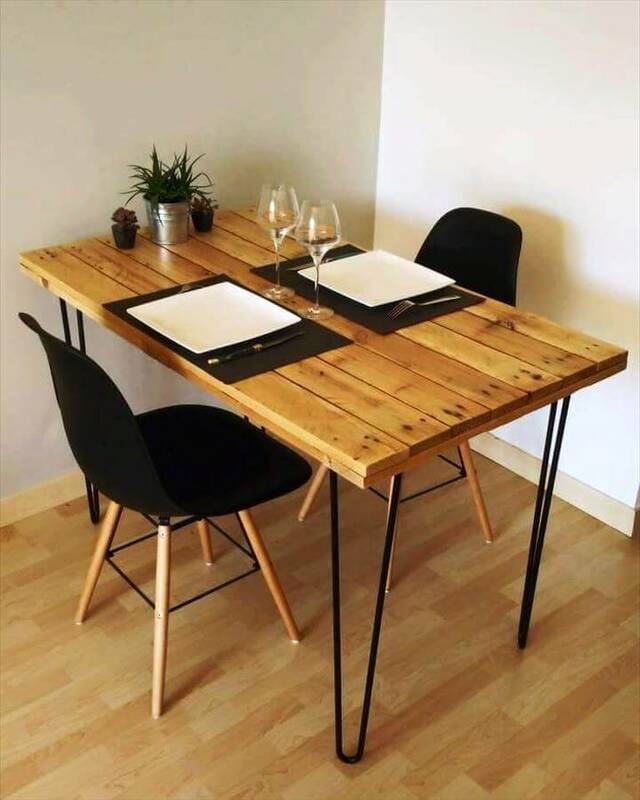 Offices are decorated and furnished with the industrial style items so give your office dining hours a style touch with this pallet made dining table standing on the robust and trendy hair pin legs. If you are newly married couple then this dining table can be a romantic part of your house with a classy styled table and the stools to sit having drawers under the seat to store. the rustic staining in brown would bring some accent and elegance in your spaces. 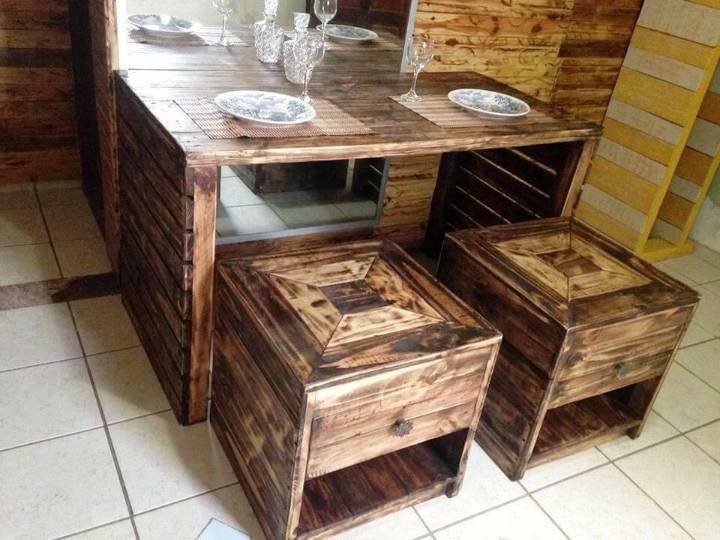 Such a breath taking design of the side board is only to be witnessed on the famous furniture brands like the IKEA but this magical looking pieces has been created at home with the pallets followed by a damn gorgeous staining session in dark purple, blue, white and brown like subtle hues. 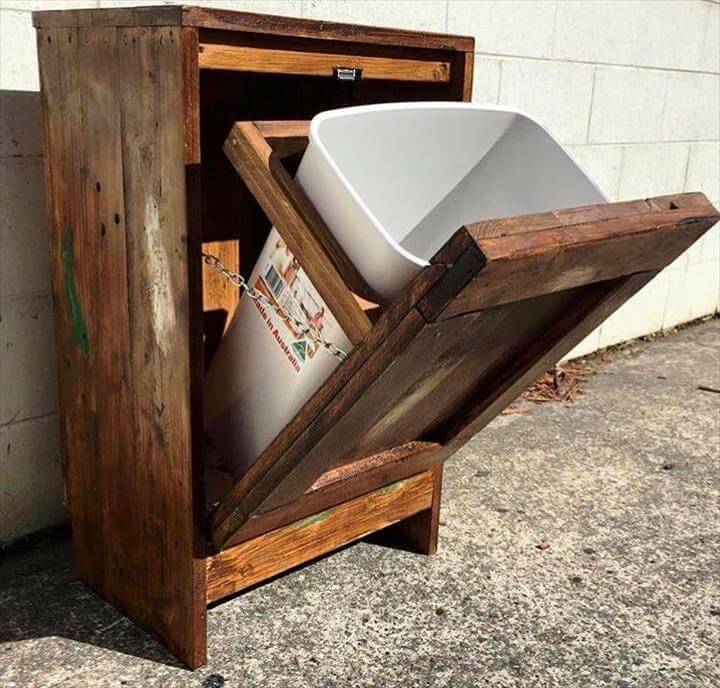 Sometimes there are no hiding spots in our spaces to house the ugly trash can there but with pallets this stylish hide out for the garbage bin can be easily created within a day. 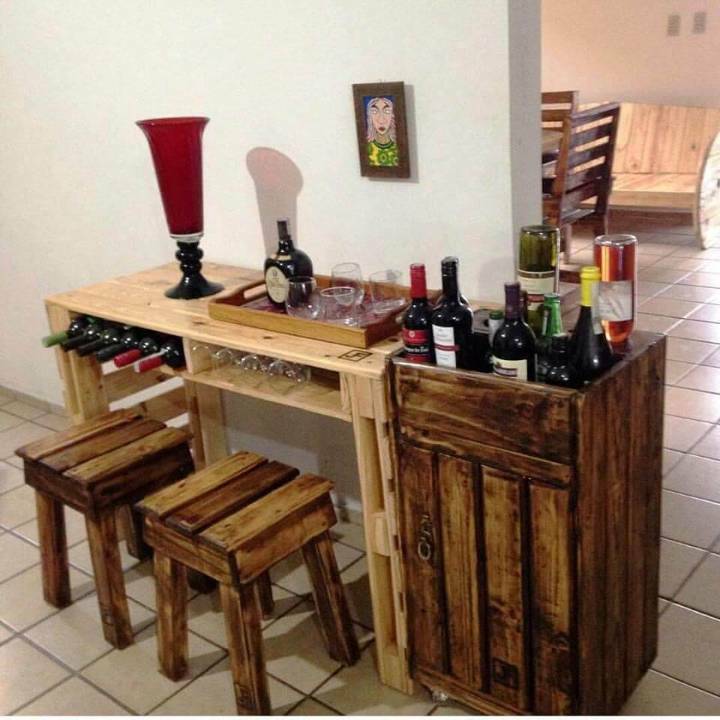 To install this simple yet fun bar in your indoor spaces three pallet skids have been used one as the top and other as the side leggy support and that is it. 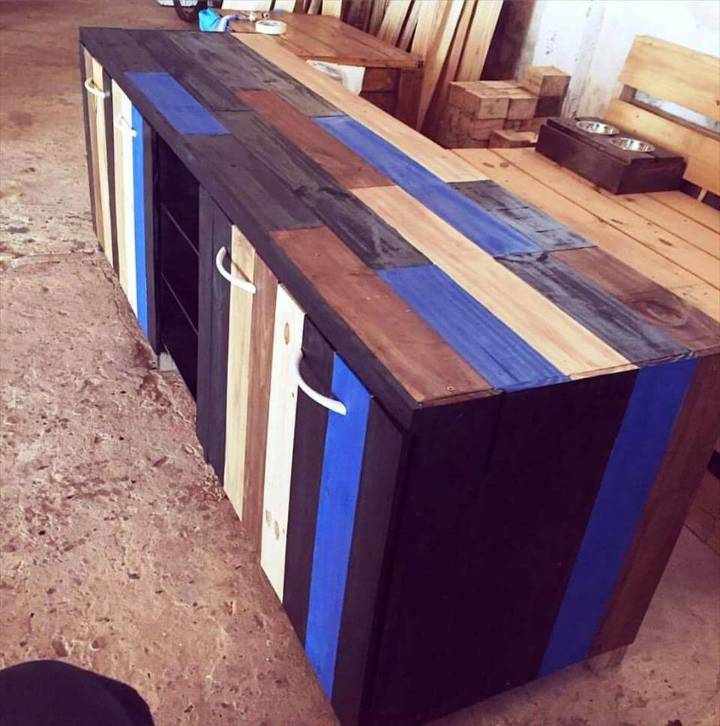 To give the indoor bar station a functional furnishing this sample is the best having a bar table, a beverage cabinet and the bar stools all simply made out of the pallet slats. 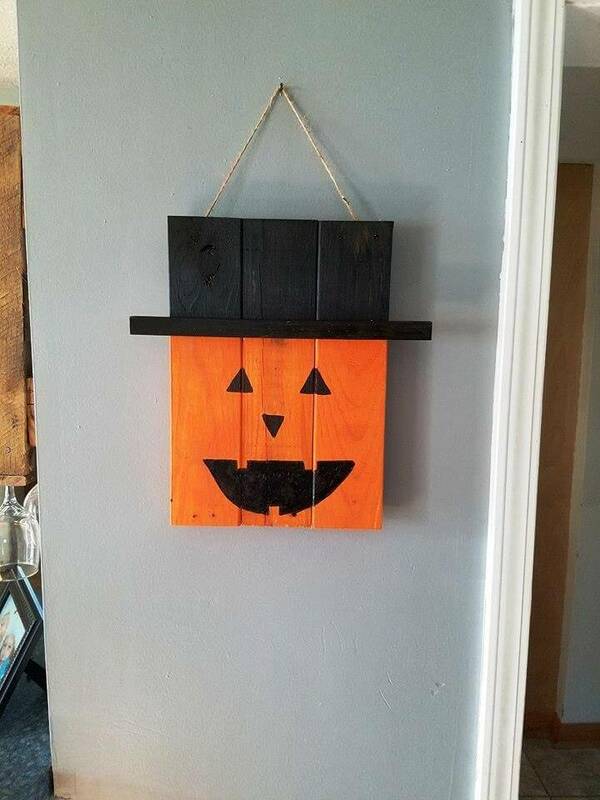 This amazing pallet Halloween decor piece is made from three pallet pieces with a cap image an jack O lantern face being painted in black on the pumpkin color base. 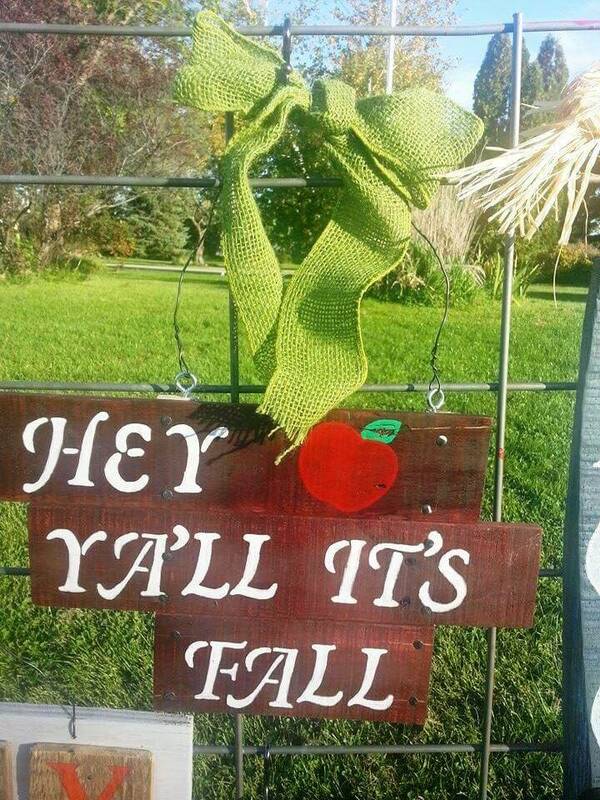 Three pallet slats being nailed together and stained in choco brown have been stenciled with the fall welcoming words to be a nice decor crafting piece for your garden or patio. 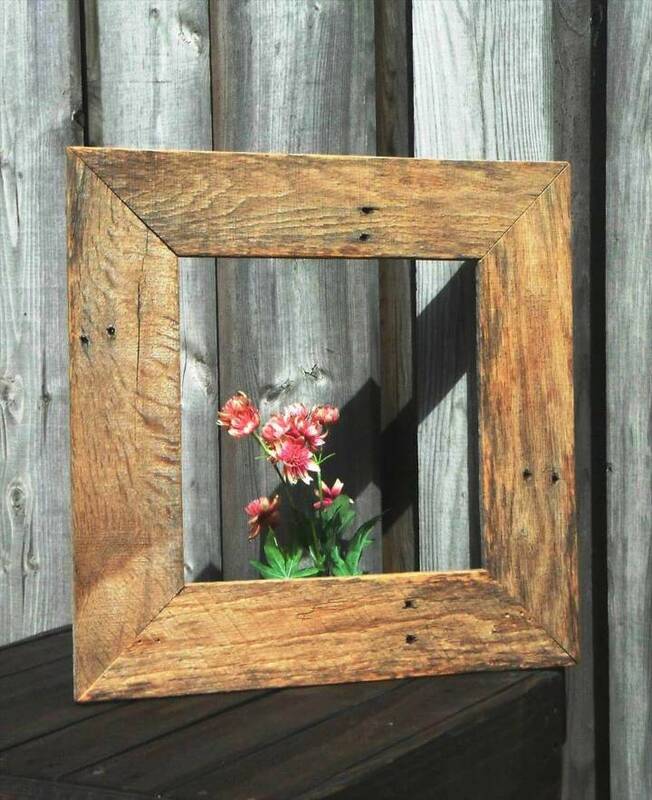 Four skewed at edges pieces have been stacked together to shape up this mini frame which you can used on the table or mantle with a nice picture of yours being displayed in it. 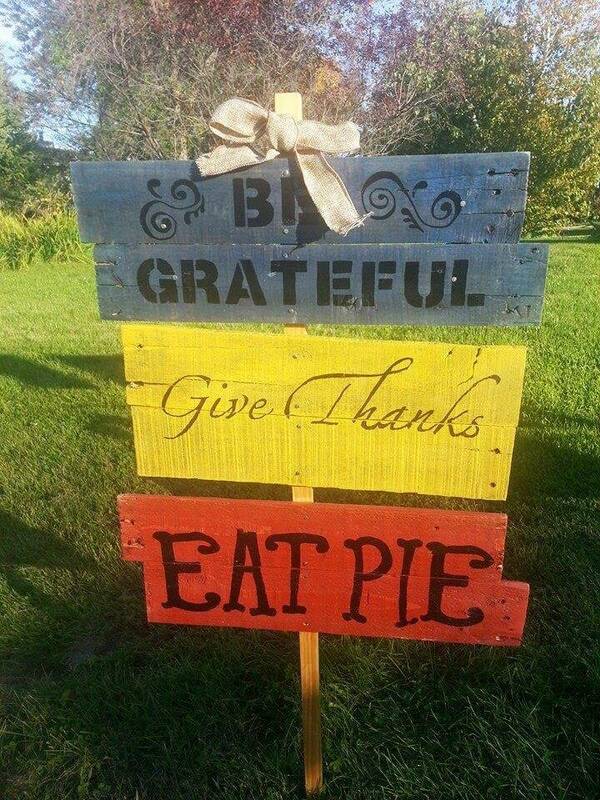 Three pallet cute board pieces have been painted in red, brown and yellow with some fun stenciled words in white to make and then stacked together with nails to shape up this cute decor craft for outdoors. The pallet pieces of different sizes have been nailed together to shape up this wall art canvas to be filled with any of your favorite artistic items, images and words. 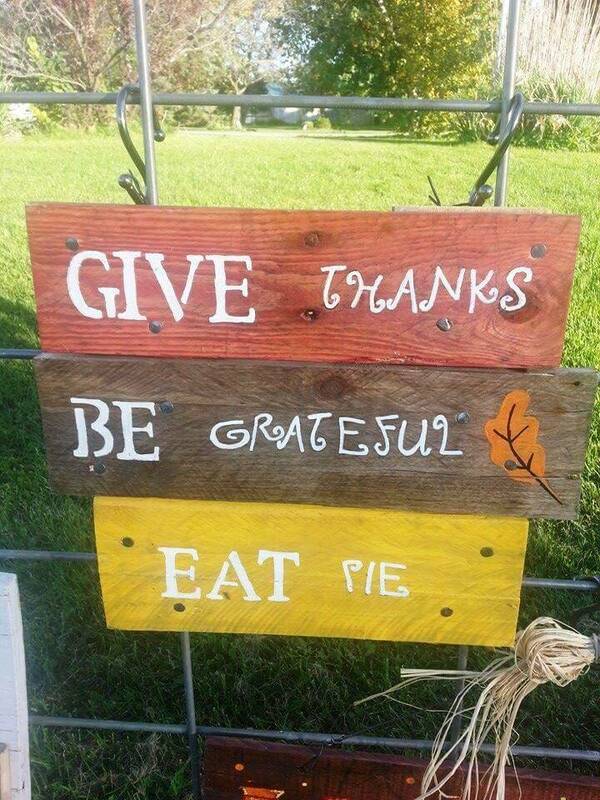 Wooden pallet slats have have been stacked on a single pallet support with three plates each stenciled with some fun words to make an interesting and inviting display in your garden spaces. 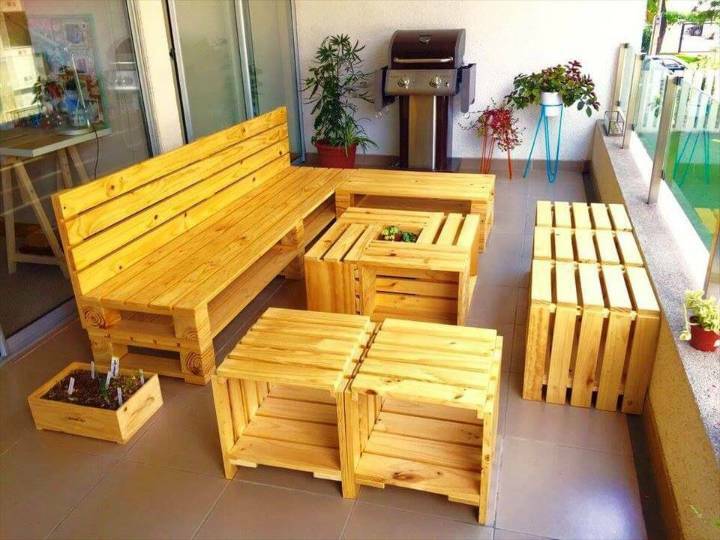 You can control yourself to utter the words WOW seeing this amazing seating set having a stylish sofa, a crate style DIY coffee table and the stool seats with a little planter box to truly dazzle your spaces at no cost. 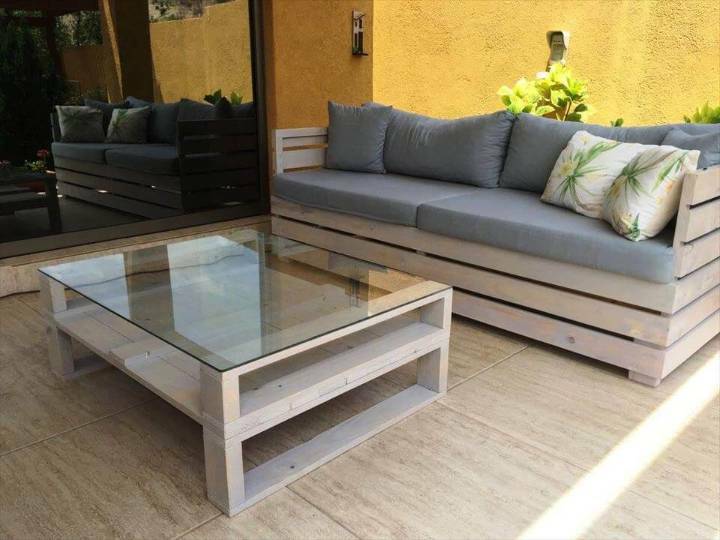 This seating set is no less than those sofa and coffee table pieces that you buy from the market at expensive prices but with pallets you can gain this beautifully designed seating at no cost. Layering the pallet skids on each other this pallet sofa has been installed and the coffee table is made from the neat stacking of slats together forming a board like top with thick pallet blocks used as the legs. 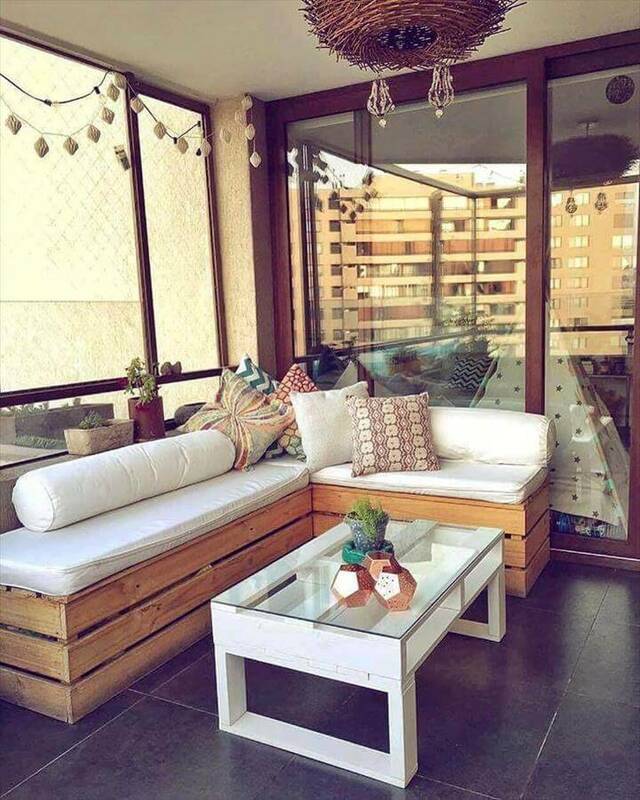 This lovely designed seating with a modern style sofa and the glass topped pallet coffee table are awesome pallet creations for those who love to go with the fashion flow and the grey stain adding more chic look to it. 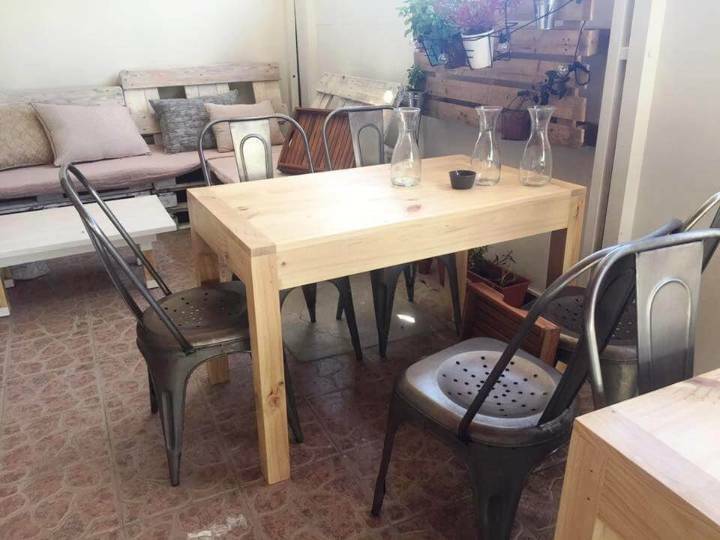 The dining table in this picture is like a little height form of a coffee table with a plain top and the four legs to fit especially in the compact and tiny spaces where there is not separate space for the dining rooms. 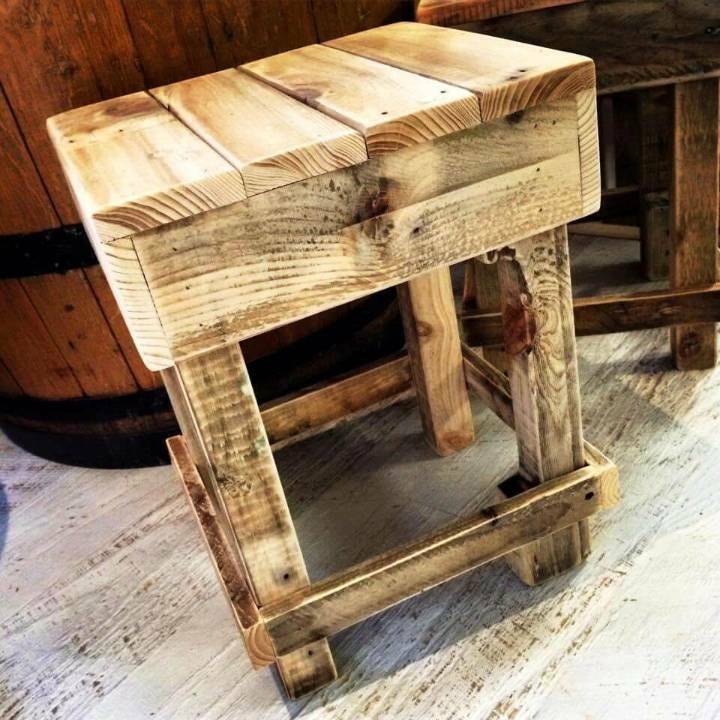 This tiny and cute stools has been easily achieved at home with the small size pallet pieces being nailed together to form the seat and the four legs with extra supporting brackets around. 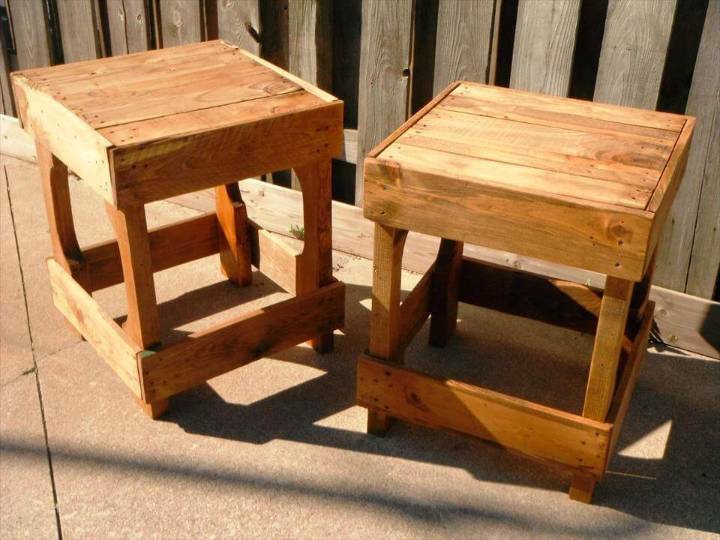 If you have a bar at home then you must make these stools to give the bar a complete fun look and using pallets these stools can be easily and instantly created at home with the nails and some stokers of the hammer. These adorable and cute mini stools have been made to look really rustic and natural in looks with the light brown stain finish after a well done sanding session.